The lack of official Xbox Live support is nothing new to South Africa, we have been shunned and treated like second class Xbox Live citizens since the box was launched locally. However this just feels like a little kick in the face. A Lazygamer reader going by the name of Baygon has sent in this screenshot from â€œOutrun Online Arcadeâ€’s multiplayer options menu. 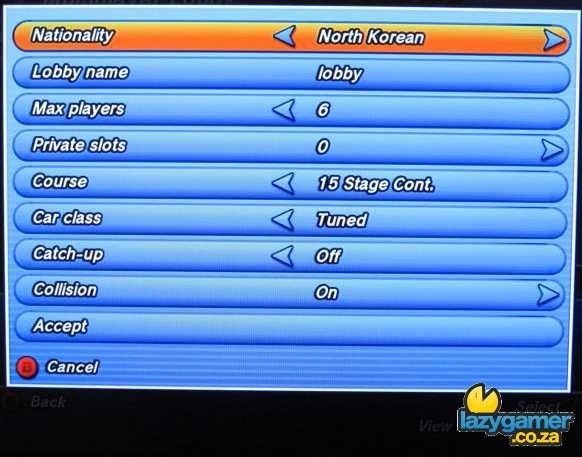 Apart from the normal options of how many players, courses and so on you also get to specify which country the players must come from. After quickly checking to ensure that South Africa had been ignored once again he carried on looping through the options and came across North Korea. Yeah the country that is now number one on the â€œAxis of Evilâ€ gets recognised and added as an option but once again we get snubbed. Maybe we should get some nukes and start threatening the world to get Xbox Live support? Or is that maybe taking it that little bit to far? Next article X-Men Origins: Wolverine – Reviewed: Ever Wanted Huge Metal Claws And A Body That Regenerates?